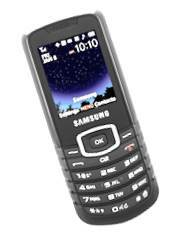 GreatCall Samsung R100 was an traditional-looking phone that lets you use GreatCall's senior-friendly cell phone services at a $60 savings over the price of the Jitterbug J and Plus phones. However, over the years, their flagship flip phone (the Jitterbug Flip) has slowly transformed into a more attractive device. So Greatcall no longer sells this device. However, I've kept the write-up below for reference purposes. The R100 has Bluetooth capability so you can use a wireless hands-free headset. Even if you don't use a Bluetooth headset, you can rely on the hands-free speakerphone. You can also sign up for Great Calls services such as Live Nurse service and the 5star emergency service, the Check-In Call service, and Medication Reminder services. The LiveNurse service give you access to trained nursing support via telephone 24 hours a day. You can also sign up for the 5Star emergency service which includes the Live Nurse service. Daily Check-In provides up to 6 daily calls to make sure you're okay. If you need assistance, GreatCall automatically notifies the designated contacts for you. Medication Reminder give automated reminder calls to make sure you're up to date on medications. You can also directly contact your pharmacy. There are also more fun services like MyCalendar to help track of appointments or get-togethers. While you can control all these services online, you can also make use do it by phone. You still have access to GreatCall's friendly customer support (free) and live operator (costs airtime). GreatCall customer support really is (in my experience) friendly, helpful and patient. The support reps are based in North America so it's always easy to understand them. For solving your problems however, they're great. The only drawback is that they do try to gently nudge you into signing up for more of their services. You can learn more about this phone by checking out the GreatCall Samsung R100 manual(pdf). The R100 doesn't have the famous large-buttons and extra loud speaker of the Jitterbug J phone. On the other hand, while the distinctive Jitterbug J is great, it is recognized as a Jitterbug phone by many people. (Note: You can now get the Jitterbug Plus which still has large buttons but looks more like regular flip phone. You can even choose a smart phone. The Samsung R100 looks like a regular compact cell phone making it more inconspicuous. This may be an advantage if you don't want to draw attention to your phone. Whether you prefer the Jitterbug Plus or the R100, the easy-to-use GreatCall Phones are great. You get affordable plans, no contracts. There are also unlimited and share plans available. Here are a few other easy cell phones that are available without a contract. The Doro phone is a flip phone with a more traditional appearance compared to the Jitterbug J. It comes with an FM radio and an emergency button on the back for dialing a designated number. The Alcatel A382 has large buttons, a radio and a flashlight.